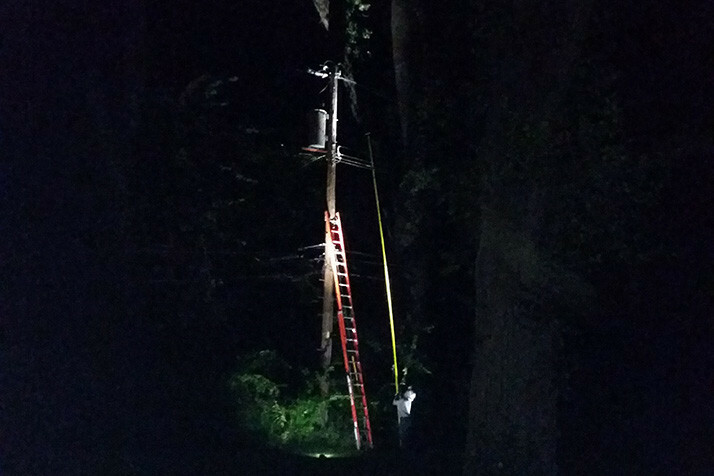 KCP&L crews were back in the neighborhood near Tomahawk Road and Roe Avenue Tuesday to fix another power outage, the sixth in about two months. Photo courtesy Inga Selders. Inga Selders was relaxing in the pool in her backyard with her three kids Tuesday night when the familiar flashes and sounds returned. The power lines hanging over her backyard started arcing, sending brilliant flashes of red and blue across the sky, with loud pops accompanying them. Unfortunately, the task of rushing her kids out of the backyard away from power lines wasn’t a new drill for Selders. Her neighborhood near the intersection of Tomahawk Road and Roe Avenue in Prairie Village has seen frequently arcing lines and power outages for three years now, and she says neighbors’ calls to KCP&L to get the issue addressed have not yielded a solution. Tuesday’s outage, which lasted a couple of hours, was the 11th to plague the block in the past two months. Four of the outages occurred during placid weather, with no lighting or wind. In hopes of getting the power utility to upgrade the aging infrastructure in the neighborhood, Selders and some neighbors launched an online petition via Chage.org last month. They enlisted the help of state Rep. Jerry Stogsdill, who lives nearby, and Prairie Village City Administrator Wes Jordan to help connect with KCP&L executives. In response to those communications, KCP&L committed to conducting a detailed ultrasound survey of the lines in the area starting next week, a process that they say should allow them to identify weaknesses that could be contributing to the frequent outages. Once those results have been analyzed, the utility plans to begin designing an updated power infrastructure system for the neighborhood, with construction tentatively slated for the end of this year. installation of the new systems would be completed around mid-summer 2018. Selders said she was happy to see movement, but that she wasn’t ready to celebrate just yet — especially given Tuesday’s fireworks. A representative of KCP&L was gathering information before being able to address Tuesday’s outage.